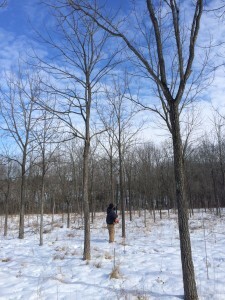 It is late February at Little Miami Farms and that means it’s time to prune the walnut trees. 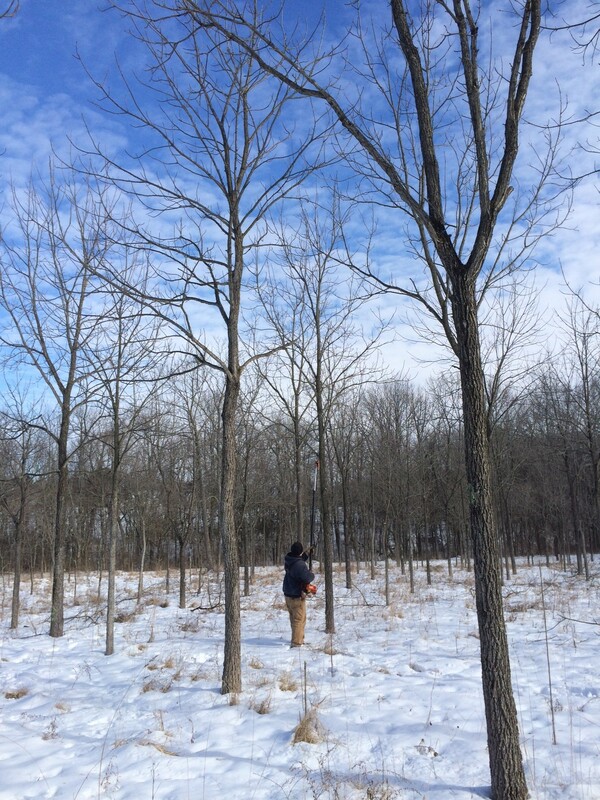 We have a 3½ acre black walnut grove with over 700 trees that came with the farm when we purchased it years ago. Black walnut trees are dormant in the winter and February is the ideal time to prune so the “wounds” from pruning have a chance to scab-over before the sap begins to run as the trees awake in early spring. We’re growing these black walnut trees for timber. Our goal is to encourage the trees grow tall and straight so that someday we can harvest the timber to make furniture-grade walnut lumber. A black walnut tree typically takes 35-40 years to grow to a size large enough to harvest. Most of our trees were planted around 1995….so we have a long time to go! The picture here shows how I prune our trees. I use a Stihl HT-101 pole pruner equipped with a 12” bar at Stihl Picco-Micro chain (which I keep sharp) to get good clean cuts in order to limit the risk of introducing disease to the tree. The pole pruner extends out to 12’ feet so the limbs that I prune are typically below 16’ high. Based on advice from our state forester I never prune more than 1/3 of a tree’s canopy in a single year, and I never prune limbs that are over 1½” in diameter. Following these basic rules simplifies the pruning process. Winter ran a bit long in Ohio this year. Typically, late February it is too late to prune walnut trees, but since the average temperature was 15 degrees the days that I pruned (and several inches of snow on the ground) there was no rush to prune this year. If you want to learn more about growing black walnut trees for timber, feel free to drop me a note on our ‘Contact Us’ page. Like many things around the farm I may not be an expert, but I know people who are. I am happy to share our lessons-learned and point out things we might do differently if we started over again.